HARLEM — Residents of the St. Nicholas Houses and state Sen. Bill Perkins filed a lawsuit Thursday to block the construction of a $100 million Harlem Children's Zone charter school in the middle of the public housing complex. The suit challenges the way the project was approved, said Sadia Rahman, an attorney for the Urban Justice Center who filed the action along with the New York Environmental Law and Justice Project. According to the suit, NYCHA should have sought permission from the city and the state Legislature before removing the parkland the school is being built upon. Some residents have opposed the project because they say the 135,000 square-foot-school imposes upon their quality of life by taking away open space. "You just have a better quality of life when you can walk out your door sit on a bench and read a book or feed the squirrels," said Rahman. The St. Nicholas Houses, located between West 127th and West 131st streets and Adam Clayton Powell Jr. and Frederick Douglass boulevards, is part of a New York City Housing Authority superblock. Buildings, parks, playgrounds, parking lots and open space stand in areas that were once part of the city street grid. "Families there use the space as part of their recreation and socializing, they have gardens and the kids play there. They are opposed very strongly to the taking of their open space and replacing it with a charter school," said Perkins, who has strongly opposed the charter school movement. Construction of the school began in April. It will house 1,300 students in grades K through 12 and is scheduled to open in the fall of 2012. The lawsuit seeks an injunction to halt construction. NYCHA declined to comment on pending litigation. The city and U.S. Department of Housing and Urban Development are also named in the lawsuit. Geoffrey Canada, president and CEO of Harlem Children's Zone, said the benefits of the school outweigh the loss of open space. "While we regret the loss of any green space in Harlem, we believe creating an unparalleled educational opportunity for the children of St. Nicholas Houses, as well as a year-round community center, more than balances the impact of losing some green space," Canada said. President Obama has modeled his anti-poverty program "Promise Neighborhoods" after the program at Harlem Children's Zone. Canada said that the approval process was "open" and "well within the law." The ultimate goal is to "break the cycle of poverty," he said. The project has also addressed residents' concerns by replacing all the playgrounds, providing landscaping in other areas and easing the inconvenience of construction by providing "dozens" of residents with air conditioners. Residents have said they are not against Canada's mission and that there are other locations where he could build a school. "To say we are against education because we are against the school's location is like saying you have a problem with God because you have an issue with one church," said William Danzy, co-founder of Citizens for the Preservation of St. Nicholas Houses, and one of 92 residents who are plaintiffs in the suit. "Harlem is more crowded now than ever before. To take this oasis away, this view, these trees and the seating capacity its a terrible situation," he added. Perkins said the case is also about setting precedent. The project is part of a wave of city-driven efforts to carve up NYCHA superblock housing projects to installnew private projects. The school on the grounds of St. Nicholas Houses also represents the first time NYCHA has broken up one of its superblock housing complexes. 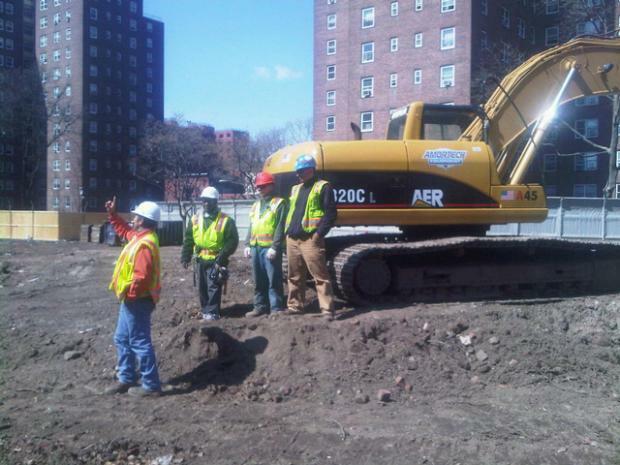 NYCHA also recently launched a partnership with Harlem RBI to build an $85 million charter school project that includes a park renovation, new headquarters for the group and 90 units of affordable rental housing on what is now a parking lot at Washington Houses in East Harlem. "My concern is, now it's charters, but what's next," Perkins asked. Rahman agreed. "If NYCHA can succeed here, the dominoes will start to fall and you will hear about other developments losing playgrounds and parking lots to private entities," she said.